Two of my friends from Recoletos Review School went to Cabanatuan City to attend a birthday party. They asked me to tour them around the City. But since they only had limited time coz they are going back to Manila the same day, I could only present only a small portion of what the City could offer. We visited the Fil-Am Friendship Shrine in Pangatian and I toured them around Araullo University, my beloved Alma Mater. Then, we had a few chat and drinks at the NE Crossing. That gives me an idea. Although the City is not really much of a tourist attraction, it nevertheless has something to offer its tourists. So, for today and in my up-coming posts, I will try to share my City and what it can offer to all of you. Just a few facts about the place. Before the war, this used to be a military training camp for twenty years but was converted into a concentration camp for Allied Prisoners of War during the Japanese occupation. Some of the supervisors of the infamous Bataan Death March from Bataan to Corregidor in April to May 1942 were imprisoned here. A shrine now honors the brave rescue of the POW`s by the Filipino guerillas led by the late Governor Eduardo L. Joson. 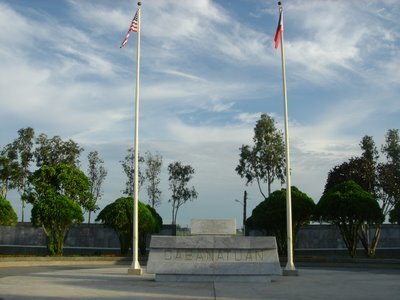 The Camp is popular tourist destination area for the veterans of WWII and their families who visit our country. Additional Info: Two places in the City, which are considered as hollowed grounds for being grim remainders of enemy atrocities, are the former site of Nueva Ecija Chinese School along General Luna Street. Where members of the underground and those suspected of anti-Japanese activities were incarcerated, tortured, maimed and killed by the Japanese Kempetai: the other Camp Pangatian which, before the war was a military training camp for 20-years old. It was converted into a Prisoner of War (POW) camp for survivors of the infamous Death March from Bataan and Corregidor in April-May. 1942. On the night of January 30, 1945, elements of the 6th Ranger Battalion Filipino guerrillas and US Army rescued 513 prisoners from the Camp that included 486 Americans, 23 British defenders from Singapore, 3 Netherlanders and 1 Norwegian. They were remnants of the original army of about 10,000 men in 1942. The rest died of malnutrition, disease and torture while others were moved to others concentration camps.